What a difference a few years make. Bringing Internet connectivity to those in a vehicle who need Internet access but lack cellular data connectivity now is at the top of virtually every Road Warrior’s Wish List. Today we embark on our first major road trip of 2016 to test mobile WiFi hotspots from the four major carriers in the United States: AT&T, Verizon, Sprint, and T-Mobile. We’ve decided to use a variety of devices with the carriers in order to give you a good picture of what’s now available in the marketplace. One reason we decided to mix apples and oranges was because few providers actually manufacture their own devices, and the actual manufacturers (Netgear and Novatel among others) tend to produce almost identical devices for every carrier. As long as you’re paying by the byte, virtually all of the cellphone providers now support tethering on a wide variety of smartphones. The major drawbacks are you’ll want a high performance smartphone if you plan to use it for tethering. And tethering eats through battery life in a hurry. Unless your phone is connected to a charger or wireless charging pad in the vehicle, this can be problematic on a long trip. Virtually all of the car manufacturers, domestic and foreign, now offer some sort of WiFi connectivity in their higher end vehicles. But you’ll typically pay a fee for their middleware plus the cost of your actual Internet usage using either your existing smartphone plan or a dedicated 4G connection in the vehicle. If you remember the price gouging on cellular calling directly from your vehicle, you’re going to love Mobile HotSpot pricing. It’s worse. With the Audi Mobile Internet Plan, we can sum it up in five words: Hold On to Your Wallet! Ford takes a different approach and uses your existing smartphone via Bluetooth as a Mobile HotSpot with SYNC® and MyFord Touch® (for a fee). Chrysler’s UConnect® takes the Ford approach and is offered on about two dozen new vehicles including the popular Jeep Cherokee and Grand Cherokee. For AT&T, we’ve chosen the integrated hotspot that is featured in many of the latest GM vehicles from Chevy, Buick, GMC, and Cadillac. 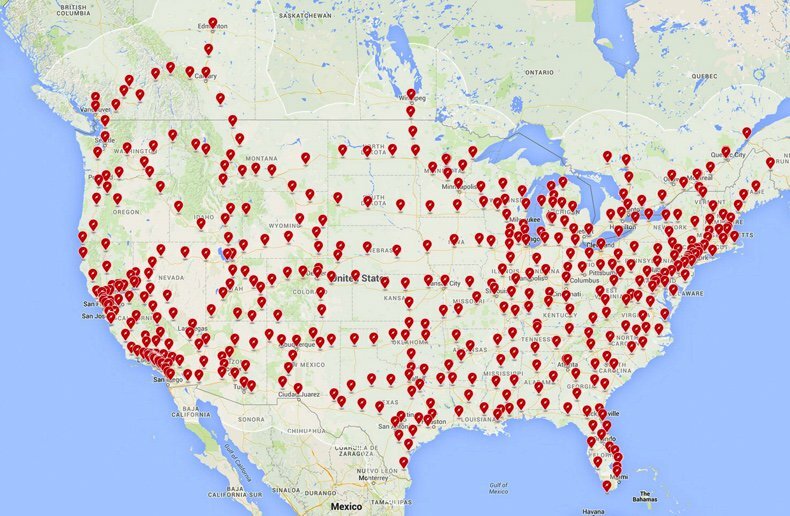 For the complete 2015 and 2016 vehicle list, visit this GM site. Yes, trucks are included. On a monthly hotspot plan through GM’s OnStar service, 5 gigs of data runs $50 whether you subscribe to OnStar or not. Another option is to purchase a bucket of data which must be used within a year (which won’t be difficult). That runs $150 for 10 gigs of data with OnStar, or $200 without an OnStar subscription. A third option is the daily plan which costs $5 for each 250MB of data. Luckily, there is a more sane option for those that already have an AT&T Value Plan for one or more phones. You can add the hotspot in your vehicle for $10 a month, and it uses your existing bucket of data from your plan. The AT&T unlimited data plans for those with DirecTV service are not available for vehicle hotspots or any other hotspots or tethering for that matter. The two main advantages of the GM approach over many of the competitors are you’re not dependent upon a smartphone for your hotspot and there is a cellular antenna mounted on your roof which will generally provide better performance. StraightTalk’s Mobile HotSpot which also uses the AT&T network flunked on the basis of cost. $75 buys you 7GB of service for up to 60 days. 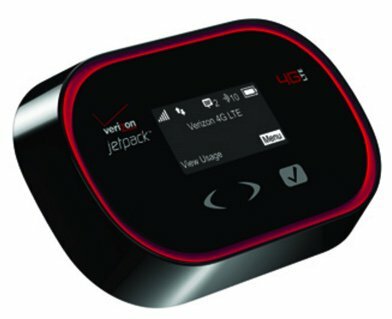 For Verizon, we’ll be using the Verizon 4G LTE Mobile Hotspot MiFi® 5510L (aka JetPack) from Novatel Wireless. An excellent review of the device is available at PC Mag. For those that travel internationally, you may prefer the 4620LE which reportedly has double the battery life. We leave ours plugged into a USB port in the car so battery life is not really a concern. We’ve previously written about Verizon’s grandfathered unlimited 4G data plans and, if you’re lucky enough to have one, this option can’t be beat. Otherwise, like all things Verizon, data plans are expensive. $100 gets you 10GB which must be used within two months. $60 gets you 5GB for use within the same period. Although pricey, it’s half the cost of the GM plan without OnStar. And, trust us, Road Warriors won’t have to worry about not using up their bucket of data in two months. We’ve previously tested Verizon’s Tasman T1114 Verizon Wireless 4G LTE Broadband Router with Voice which is manufactured by Novatel. The main drawback of this device was that it required a 110 volt connection using a beefy 3 amp power brick. Our testing and that of PC Mag suggests it isn’t the best choice on the basis of performance either. Preliminary testing suggests the 5510L provides almost triple the data performance under identical conditions. And we found that to be true even after we added dual external antennas to the T1114. Don’t waste your money. For Sprint, we initially chose one of their MVNOs, Karma Go. And we were looking forward to giving it a workout on the highway. But it was not meant to be. If you follow the trade rags, you know that they originally promised unlimited data with their WiFi hotspot for $50 a month. That lasted about 45 days, and they cut the data rate from 5 Mbit to 1.5 claiming that some folks were using too much data. Duh! That approach lasted about two more weeks, and they implemented a 15GB cap on 4G service with throttled service thereafter that would have you yearning for your old 28.8 modem. Generally speaking, Sprint’s network isn’t that bad from a performance standpoint IF you have service at all. But, in light of all the bad karma surrounding this service, we wouldn’t recommend it to anyone at this juncture. We returned our device within the 45 day trial period for a refund. We’d suggest you do the same. In its place, we’ll be trying out the RingPlus phone that we wrote about last week and that also uses the Sprint network. Unfortunately, our phone lacks tethering capability. Boost Mobile’s MiFi offering which also uses the Sprint network didn’t make the cut either. It only supports 4G LTE which means you’re dead in the water once you’re out of range of a 4G LTE tower. An unlimited* 4G LTE data service on the T-Mobile network which we first considered was MetroPCS at $60/month ($55/month on a Family Plan). However, MetroPCS pulls the same stunt as AT&T in the fine print of their so-called "unlimited" plan. It indicates that your service will be "deprioritized" after reaching 23GB of LTE data usage. That’s the new word for crippled and throttled which these providers just can’t quite bring themselves to say. We saved the best for last. If you do have T-Mobile 4G service in your area (and most folks do as of the 2015 expansion), here’s a deal you can’t refuse. For $35 a month on the Simple Choice (post-paid) Plan, you get 6GB of data at 4G speeds and unlimited (throttled) data for the balance of the month. But there’s a silver lining with a 6GB or greater post-paid plan, you also get unlimited video streaming at DVD quality without additional cost for a couple dozen services including Netflix, Amazon Prime Video, ESPN, HBO, and numerous other providers. If you have kids and travel, this is a no-brainer! The complete list of BingeOn providers is available here. 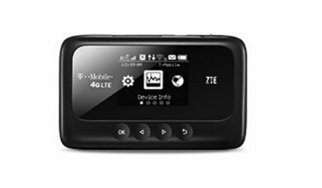 For our WiFi device, we chose the ZTE Z915 4G LTE Hotspot (above). Before we hit the road, let’s provide some points of reference on data usage. The simplest to understand is NetFlix. At their lowest streaming video rate, you will burn through .3GB per hour. At the medium SD rate, it’s .7GB per hour. At the best video HD rate, you’ll burn through 3GB per hour. And Ultra HD gobbles up 7GB per hour. You can set the playback rate in your account under Profile -> Playback Settings. At the very lowest data rate, you’ll get about 11 movies out of 5GB of data. With a 4G connection and the NetFlix automatic data settings, you’re unlikely to make it through 2 movies with a 5GB plan. So you’re well advised to hard-code your playback rate before you hit the road if your family is into movies… unless you choose the BingeOn option with T-Mobile. The reported Gotchas with the Binge On feature are that it’s a lower quality video stream and once you use up your 4G data allowance for the month, the Binge On feature ceases to function. So you’d want to carefully choose your plan and monitor your data usage to avoid any surprises. As for the quality of the video stream, we’ve read the complaints about this. But it’s a red herring in our testing. Video playback is at DVD quality, and we’re having a hard time believing most folks need something better for a ride in the car, particularly on smartphones and tablets. And we noticed no appreciable degradation even on a 13″ notebook. There’s also been some squealing that BingeOn violates the FCC’s Network Neutrality rule. Our reading of the rule suggests otherwise. First and foremost, BingeOn is an optional service. Any consumer that doesn’t want it can turn it off. Second, for anyone that has ever managed a network with limited bandwidth, the first thing you come to appreciate is the need to control streaming media content. T-Mobile is well within the network neutrality guidelines in doing so, and they’ve done it in a vendor-neutral manner by applying a throttling mechanism to all streaming content that can be identified as such. For those that use encrypted communications for streaming, T-Mobile has offered to work with them to find a way to identify their streaming content so that they, too, can be included in the BingeOn program. Others have suggested that providing video streaming for free while charging for data associated with web browsing also violates network neutrality. We believe the clear intent of the rule was to outlaw discrimination in favor of particular vendors with regard to similar types of Internet content. Any other interpretation would mean that services such as free calling and free text messaging would also violate network neutrality. While this might thrill the Bell Sisters (Verizon and AT&T), it’s difficult to see how this benefits any consumer using the Internet. For our 300-mile trip today, we’ve chosen a travel path that provides a good mix of interstate highways and less traveled state highways. The topography ranges from flat terrain to sparsely populated mountain areas where cellphone towers are few and far between. 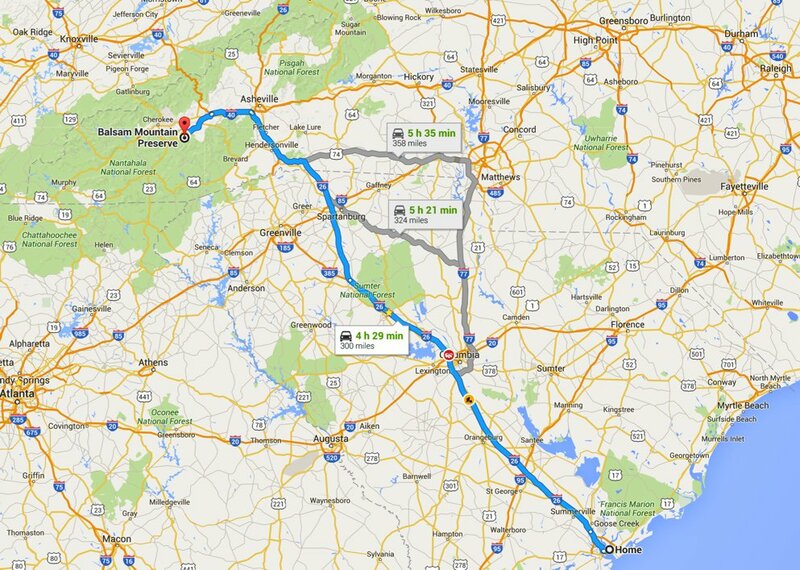 In between, there are a few metropolitan areas including Charleston, Columbia, Spartanburg, and Asheville. These are mixed with tiny towns including Waynesville and Sylva, North Carolina near our destination. Interestingly, these small towns reportedly boast some of the best cellular data performance in the country. We shall see. We’re big Spotify fans so most of our AT&T testing will involve listening to the latest Spotify playlists using Apple CarPlay. If the music hiccups, we’ll know we have an AT&T problem. From time to time, we’ll activate a WiFi network connection on our iPhone to check out performance of the Verizon and T-Mobile HotSpots. One of our travelers is a big Facebook gaming enthusiast and, to support that endeavor, we’ll configure her tablet to use the AT&T WiFi HotSpot built into the vehicle. Well, the results were pretty much what we expected. Sprint calling and T-Mobile streaming worked well along the interstates and went from bad to worse once we hit the state highways. AT&T and Verizon didn’t miss a beat door to door. T-Mobile remains the best bargain for streaming unless you have an unlimited data plan without throttling. Even then, the cost difference is staggering. Our unlimited Verizon plan now runs over $100 a month while T-Mobile is a flat $35. There were some random hiccups in the T-Mobile streaming from time to time which we never experienced with Verizon. But you can’t beat the price! Both AT&T and Verizon have dramatically improved their "mountain coverage" in the past year. 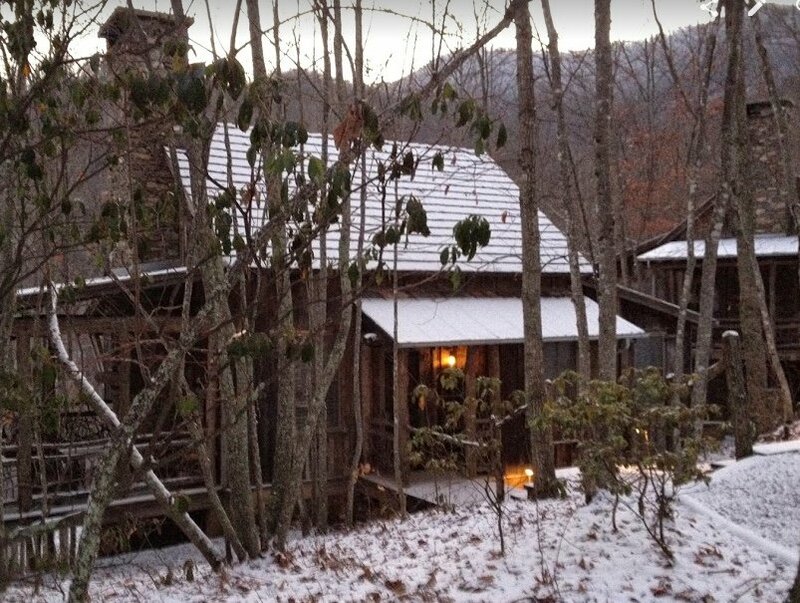 In the past, Verizon coverage at our cabin was non-existent and AT&T only worked by strategically placing your smartphone on the outdoor fireplace mantle. Now both have reliable 4G service. Our Verizon HotSpot provides consistent 10Mb download and 5 Mb upload speeds, about 5 times the performance of the DSL connection provided by the local telephone company.